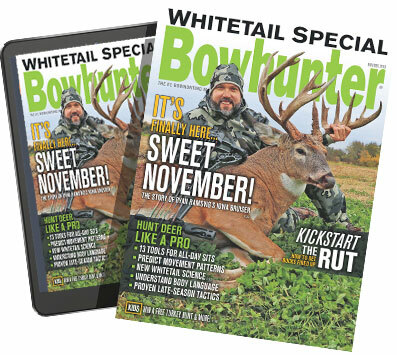 My hunting partner, Ryan Hawkins, looked at his phone and simply said, “Not good.” The weather forecast was calling for a massive storm to roll through the Midwest, leaving in its wake enough snow to shut down the interstates. 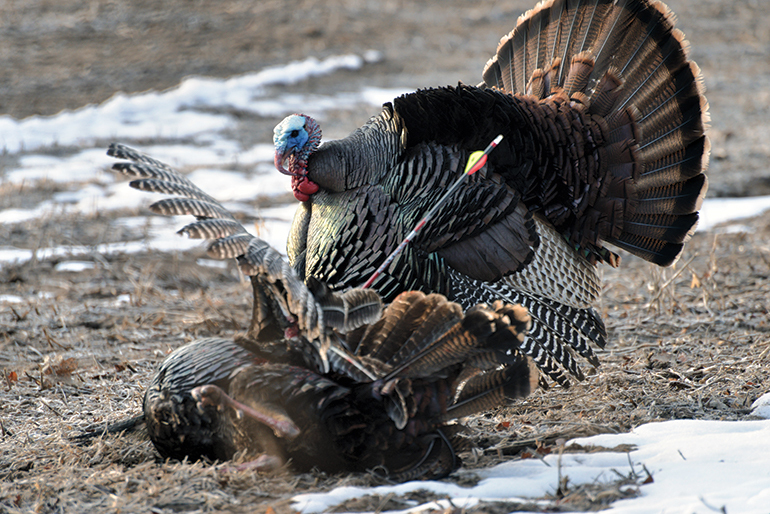 We had a two-day window in which to fill our turkey tags in Nebraska and then get out. If we didn’t, we potentially would be stuck in our tents for a few days in a blizzard. Tipping the odds against us further was the fact that we’d be bowhunting public land, and we had no idea how much pressure the property had already experienced, or even if the wintering flocks had busted up enough to move some gobblers onto the parcel we’d be hunting. We discussed all of these possibilities to the point where there was nothing left to say during the seven-hour drive. It was past midnight when we set up camp in the dark and readied our gear for the early morning alarm. A few distant gobbles rang through the valley below me as I set out decoys and gave my blind, which was tucked into an island of cedars, a once-over. After settling in, it quickly became clear that I was dealing with one big flock, and that flock was moving farther away from me by the minute — likely toward some private food sources. By lunch, I had everything moved deeper into the valley where I could overlook a small meadow that bordered a patch of oak trees. I never saw a turkey, or heard a gobble, until 6 p.m. That was when a tom responded to my yelping and gave me my first ray of hope after a long day of blind-induced boredom. Every time I called to the tom he gobbled, and after going back and forth a few times, I shut up. Within a minute, I could hear wingtips dragging in the yellowed grass. A few seconds later his bright-red head periscoped out of the cover, and the longbeard strutted up to my jake decoy. He froze in place directly behind the faux juvenile, and in a panic I drew and settled my pin, thinking he’d seen something he didn’t like. My arrow sent a puff of back feathers into the sky, and the bird jumped about six feet before deciding he wasn’t going to take that kind of attitude from my decoy. The second time I drew, he was standing broadside and giving the jake a wing beatdown. My arrow looked perfect, but the bird started limping away and then gave his best effort to fly. He landed in an oak tree on a low limb, but he couldn’t steady himself and soon fell out. After that I couldn’t see him, and the only sound I could hear was the barking of a lone squirrel. With two tags and plenty of uncertainty about how the situation would play out, I started calling, thinking I needed to give my bird some time. It didn’t take long before a tom answered me, but he hung out on the ridge above my blind, shouting the whole time about how I should come to him. Eventually I got out to trail my bird, and when I did I spooked him from beneath a deadfall. He flew, and I knew that I’d need to leave him until morning, which is something I’d never done with a turkey. That night in our tents, Ryan and I talked about how lucky it would be if the bird died there and didn’t end up in a coyote’s belly. We also discussed the storm, which was less than 24 hours out at that point and was fodder for a continual stream of text messages from his wife and mine. At first light, the same flock of birds serenaded me and moved off like they’d done the day before. The ridgetop tom returned as well, but he wasn’t coming downhill no matter how much I pleaded with him. An hour into the morning, I couldn’t take the suspense any longer, so I crept out of my blind and walked through the frosty grass to the spot where I had jumped the bird the night before. There he was, dead, not 50 yards away, with my arrow still in him. One miracle down, I thought. I hunted a bit longer before deciding I’d better get my tom back to camp and pieced out. I packed up my gear and started hiking out, and was about 40 yards from the ridgetop, when a familiar gobbler lit up. I shed my pack, nocked an arrow, and started sneaking up the hill as the bird gobbled nonstop. We met on the ridgetop, and the first time I drew the bird just side-stepped behind a bush, preventing me from shooting. The second time I drew, he was walking away down the hill. I guessed the range, settled my pin on his neck to drop my arrow into his chest, and then released. The tom wasn’t as far as I had thought, and my arrow hit exactly where I was aiming. I’ve seen head-and-neck carnage on plenty of shotgun-killed birds, but this was a new experience for me while bowhunting. My two-blade mechanical hit the bird’s neck lengthwise, and dropped him as if I’d dumped him with a load of five-shot. Miracle number two was in the books. I carried about 45 pounds of turkey into camp and realized that while I was tagged out, it would take Ryan nothing short of divine intervention to do the same. He had never arrowed a bird in his life, so to double up in a single morning would be a serious accomplishment. I was busy shooting photos and then butchering my birds when I saw Ryan walking out, and he was grinning like he’d just arrowed a 400-inch bull elk. He had a jake over each shoulder, and he then proceeded to tell me one heck of a story about how he’d called in a single hen and then a flock of jakes, and then he managed to do twice in one morning what he’d never done on several previous bowhunts. The storm did hit, and it did shut down the roads, but we were already halfway home before it broke across Nebraska. That same storm dropped some snow in Minnesota, and it left us with a serious cold front by opening day. The birds were flocked up, the air was brisk, and to top it off I had a six-year old with me when I headed out in the dark. One of my twin daughters, Josephine, had decided she wanted to see what turkey hunting was all about. I’d hunted for a few hours the afternoon before, so I knew we were in for a tough hunt, but at the very least we’d hear plenty of birds. She clutched a Thermos of hot chocolate as she hiked next to me along an icy two-track in the dark. We were settled in and whispering to one another well before first light. I knew there was a giant flock of birds on the farm, likely roosted behind us, but I wasn’t prepared for the level of gobbling we’d hear as soon as the first bird lit up. Jo’s face reflected pure awe as at least 15 longbeards sounded off, and with them dozens of hens started yelping. I knew it would be tough to move that flock, but I thought we might be able to get a bird to peel off. After flying down, the birds started to work their way off, and I didn’t know there was a jake standing directly in front of our blind until I peeked out, and then my hunting partner poked her head up. I honestly don’t know which one of us spooked the jake more, but I do know that it was a cautionary tale for both of us because the sun was blazing into the blind and we weren’t going to get away with movements like that on any turkeys. I told Jo we’d have to duck low in the blind if another bird worked in, so we wouldn’t get spotted. The action slowed some and Jo told me she was getting cold. I was helping her slip into a sleeping bag when a bird gobbled nearby. I yelped a few times and saw a tom come running along the woodline right to us. Jo knew not to move as I slowly slid to the ground and grabbed my bow. I could just see the tips of his fan when I clipped on. As the tom started slapping my jake with his wings, I drew and rose up on my knees. He spotted me but only ran a few steps before stopping. As soon as he went beak-first into the dirt, a second bird popped into the field and sprinted in. We watched as the longbeard took out all his frustrations on his recently fallen buddy. Twice we spooked him away, and twice he came running back in. 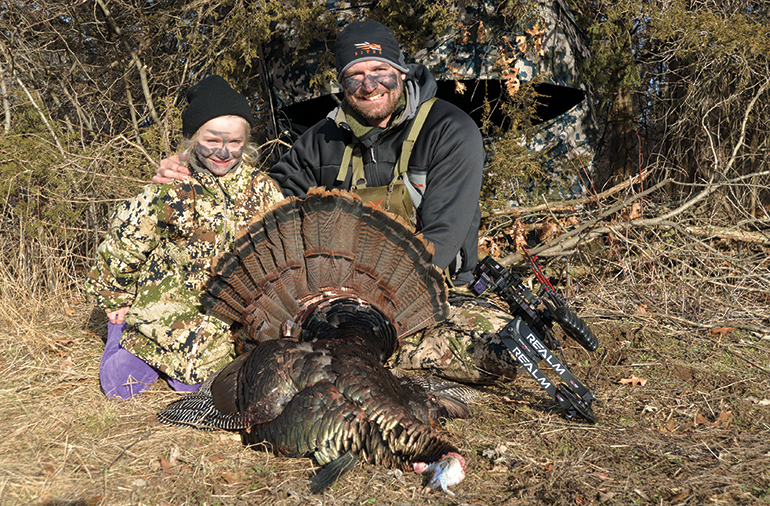 Had my daughter not been there to witness it all, it still would have ranked high on my list of most memorable turkey hunts in a lifetime of turkey hunting. But with her there, to see and hear everything was pretty amazing! By the time the second tom wandered off, Jo was like bottled lightning in the blind. She couldn’t wait to get her hands on the bird, and when I finally unzipped the door and set her loose, I saw a head of blonde curls streak past the blind window. The only time she ran faster that morning was when we returned home and she sprinted inside to tell her sister and mother the story of our hunt. I didn’t expect to fill three tags with only a few days of blind time under my belt, so I started looking at options for a May hunt. After some research, I settled on a leftover Iowa tag. I was going to hunt public ground in a part turkey hunt, part deer-scouting adventure until a good friend called me and said he was hunting the same time period and zone as me. He mentioned he could get us permission on some private ground, so we made plans to meet up for a long weekend and give it a shot. I drove to Iowa and met up with Adam at his parent’s house, and in the morning we drove out to the farm. I was toting a bow and Adam had a shotgun, so after we set our blind on the edge of a ridgetop hayfield, we decided anything that came in and worked the decoys well was all mine. Any shy birds that wouldn’t commit would be his. One of my favorite strategies for midseason or late-season birds is to call with a buddy and try to really get something going. This is what Adam and I did, and it didn’t take long before a couple of jakes gave us a drive-by at the edge of shotgun range. I gave Adam my spiel on how there aren’t any trophy turkeys and that he should shoot one in the face, but he passed. The tom stood stock still next to the jake decoy, and when I drew, he never budged. My arrow drilled his wing bone and knocked him over. The old tom got up and started running across the field, but it was pretty obvious his lights were going out within a few seconds. That bird made it four longbeards in only a few days of bowhunting in three different states. It was an incredible spring, the likes of which I’ll have a hard time repeating this year, or any year, quite frankly — although I fully plan to try my hardest to make it happen. Author’s Notes: For these hunts I used both Hoyt and Bowtech bows; Gold Tip and Carbon Express arrows; Rage broadheads; Black Gold and Spot Hogg sights; QAD rests; Maven optics; Primos, Xenek, and NAP blinds; Sitka Gear clothing; Knight & Hale calls; ALPS OutdoorZ packs; Cabela’s camping equipment; and the onX Hunt app.